Plaza del Mercado’s new anchor store, LA Fitness, now has a sales office open in the shopping center on Bel Pre Road in Layhill. The temporary location (pictured) is located two stores down from CVS, next to the Peruvian restaurant, La Fogata. Inside, you can hear about the costs and benefits to new membership, as well as get a look at the floorplan/layout of the new facility. According to staff, the new fitness center has an opening date set for December 1, 2016. According to a handful of reports by those who’ve visited the sales office, established pricing appears to mimic longtime LA Fitness plans. The basic membership entails a $25 initiation fee and $34.99/month thereafter (this is apparently guaranteed not to increase). The first and last month’s dues are payable up front, and then your first regular monthly payment would be due January 1st. You can add a spouse to your plan, and their rate becomes $5 less per month. If you’re looking for more of a bargain, you can ask to pay years in advance. If you pay 3 years up front, for example, your monthly rate is reduced to $27.00 (all $962.00 due now). Feedback from the LA Fitness sales staff confirms that the lap pool is of significant interest to those who’ve signed up so far. The pool itself will be a typical length (guessing around 50 meters), but will only be 3 lanes wide, similar to the one pictured above. You can get more information from them about how pool time is shared/reserved to avoid lines and unwanted wait times. 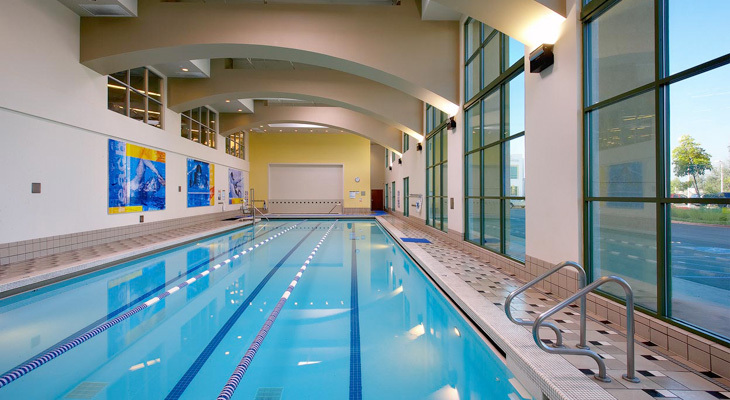 The location will also have a basketball court (with leagues), child sitting, and of course plenty of free fitness classes for members, both in and out of the pool!